To apply the predictive power of a model to predict customer behavior, create a strategy that references that model. uPlusTelco wants to improve the experience of their customer support by predicting the reason for each customer call. 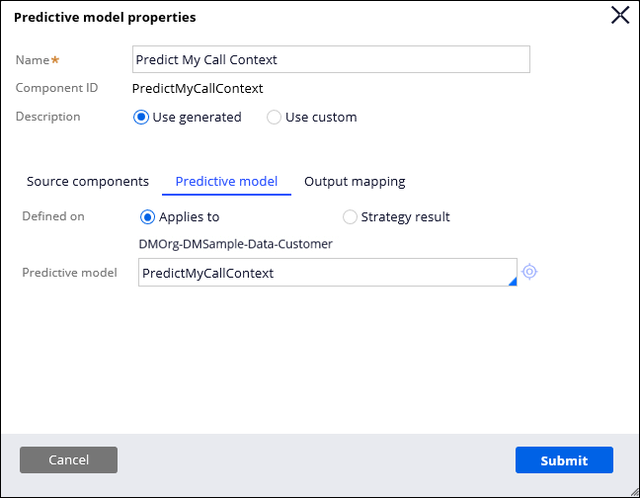 To achieve that goal, the data analytics team built a predictive model and uploaded the model to Prediction Studio. Your task as a system architect is to create a decision strategy that uses that model and to deploy the strategy in a decision data flow. Import a PMML model and map its predictors to Pega Platform™ properties. See Importing and configuring a PMML model. In Dev Studio, click Create > Decision > Strategy. Verify the initial settings, and then click Create and open. Add the Predictive Model shape by right-clicking the canvas and selecting Decision Analytics > Predictive Model. Connect the Predictive Model shape to the Results shape. Double-click the Predictive Model shape. Verify the settings and click Submit. Add your strategy in a decision data flow to make predictions with the predictive model that you created. The source data flow that gathers customer data for your strategy. The target data set for collecting decision results. The same data set is later used as the source in the response strategy - Set Responses to Monitor Models. After running this decision data flow with your own strategy, the Decision Results data set contains a list of interactions with individual pxInteractionID property values for later analysis in predictive model monitoring. In Dev Studio, click Records > Data Model > Data Flow. On the list of the Data Flow rule instances, click MonitorPredictiveModels. On the data flow canvas, click Save as. 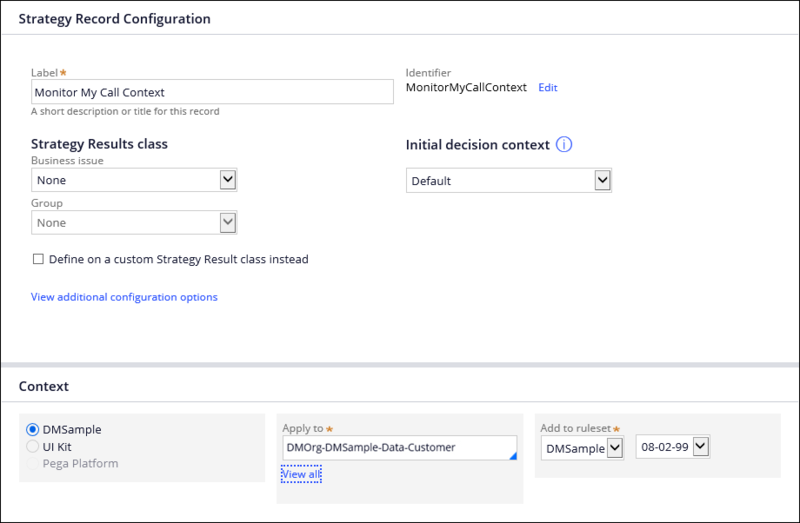 By turning this setting on, you configure the strategy to store the decision data in pxDecisionResults for delayed adaptive model learning and for issuing a response capture at a later time. Leave all other settings unchanged. Click Submit. 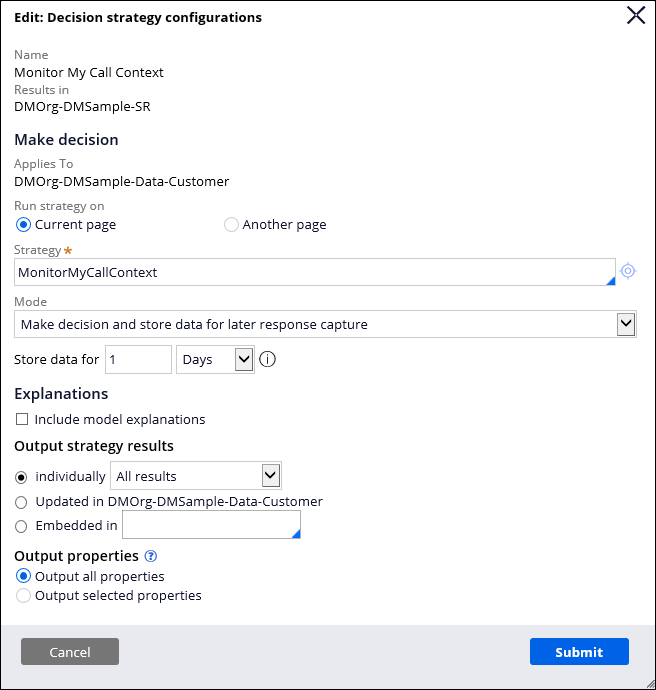 You have created a strategy that uses the Predict My Call Context model to predict future customer behavior, and you have referenced that strategy in a decision data flow. Define the model objective and outcome to monitor by creating a response strategy. See Creating a response strategy. To view the main process outline for this tutorial, see Monitoring predictive models.